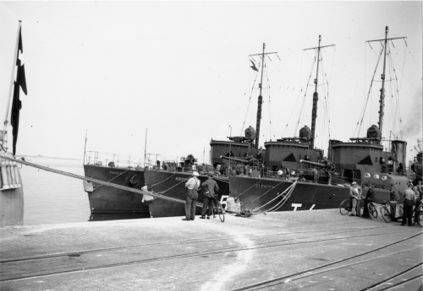 The three Torpedo boats of the GLENTEN Class moored side by side. From outer left ØRNEN, HØGEN and GLENTEN. 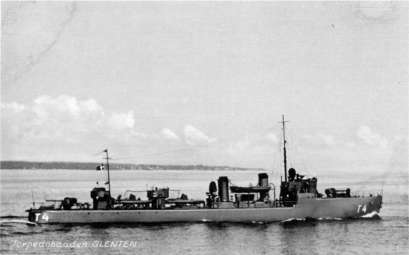 The GLENTEN Class was an improved version of the earlier DRAGEN Class torpedoboats (1930-1941) and had almost identical dimensions. 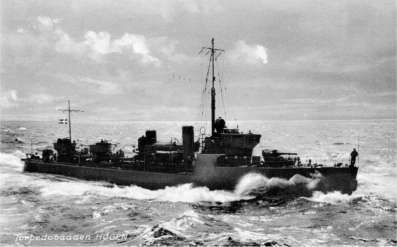 - Several sources mention the 3 torpedo boats of the GLENTEN Class as being part of the DRAGEN Class, but this must be resolved as incorrect. The GLENTEN Class was armed with 87 mm guns as main armament and only four torpedotubes on the deck, where the DRAGEN Class had 75 mm guns and six torpedo tubes on the deck. 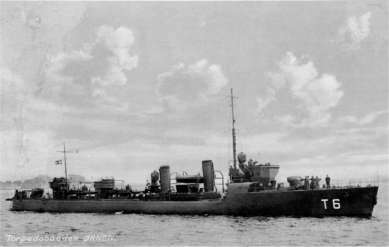 The Royal Danish Navy was constrained to hand over 6 newer Torpedo Boats to the German Occupation Force in February 1941. This were the 3 boats of the GLENTEN Class and 3 boats of the DRAGEN Class. - The boats were disarmed before the hand over.